As part of moving my ESXi environment from 5.5 to 6.0, I have a 2012 Mac Pro which I’m using to host my OS X test environment for work. As this server is already configured the way I want it, I wanted to do a straight upgrade and preserve my existing settings and datastores. Fortunately, the 2012 Mac Pro is listed on VMware’s hardware compatibility list as being supported hardware. While ESXi 6.0 is not yet listed as a supported release, I had it on reasonably good authority that I could use the stock ESXi 6.0 installer to upgrade. All I needed to do was get a copy of the ESXi 6.0 installer ISO file from the VMware website and use Disk Utility to burn the ISO file to a CD. For more details, see below the jump. Something I’ve been doing for a while is running ESXi on my home server setup. Up until now I’ve been running ESXi 5.5.x on a 2011 Mac Mini, but with the release of ESXi 6.0 by VMware, I decided it was time to upgrade to new hardware. I opted to use the 2012 Mac Mini Server over the 2014 Mac Mini because the 2012 Mini Server uses quad-core processors with hyper-threading. Hyper-threading effectively doubles the number of available processors, so I would be upgrading from four available processors on my 2011 Mini to eight available processors on my 2012; in turn doubling the number of virtual machines which I could host and run inside of ESXi. Unlike my previous installation of ESXi 5.x on a 2011 Mac Mini Server, where I needed to add ethernet drivers to the stock ESXi 5.x installer, ESXi 6.0 will install and work without additional drivers or installer modification needed. All I needed to do was download a copy of the ESXi 6.0 installer ISO file from the VMware website, use Disk Utility to burn the ISO file to a CD and use that to install ESXi 6. For more details, see below the jump. Oracle has released a new update for Java 8, but has continued their recent trend of not bumping the version number. Oracle has put out a new build of Java 8 but didn’t bump the version number from Java 8 Update 40, which makes this the third release of Java 8 Update 40. At this point, it appears that Oracle is now providing the install application across the board. 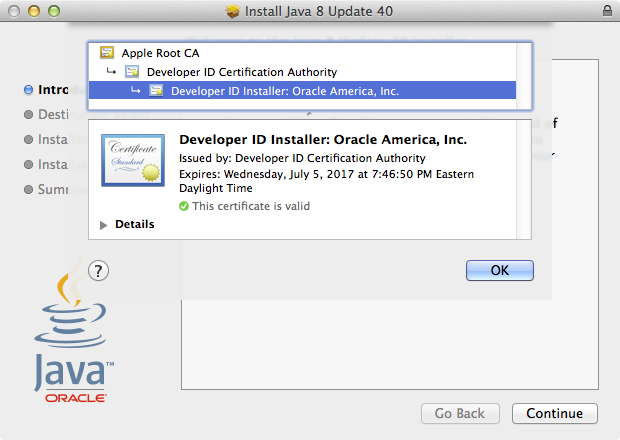 When you update an existing Java installation on OS X via Oracle’s Java update mechanism, you will receive Oracle’s install application for Java along with the selected option to install the Ask.com browser add-ons. 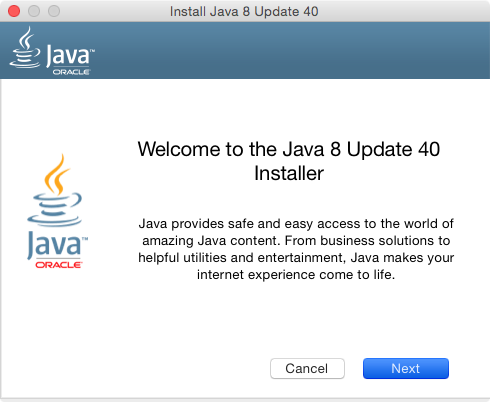 If you download an installer from Java.com, you will also receive this install application. 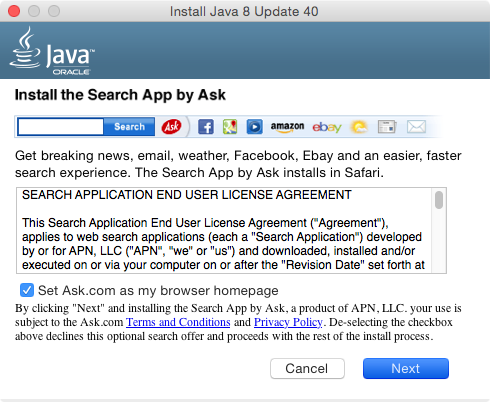 The JavaAppletPlugin installer package is digitally-signed and does not include the Ask.com browser add-ons. 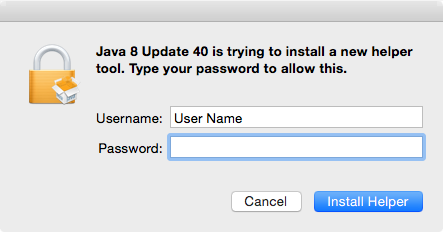 Oracle has released a new update for Java 8, but this update has an interesting wrinkle. 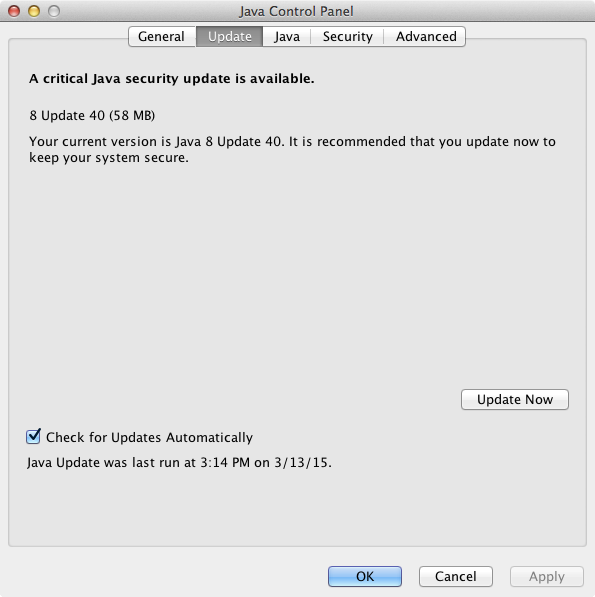 Oracle has put out a new build of Java 8, but didn’t bump the version number from Java 8 Update 40. So folks who have the previous version of Java 8 Update 40 installed may receive a message to update to Java 8 Update 40 from their current version, which will also be Java 8 Update 40. For those thinking this sounds familiar, Oracle did the same thing with Java 8 Update 31 in February. 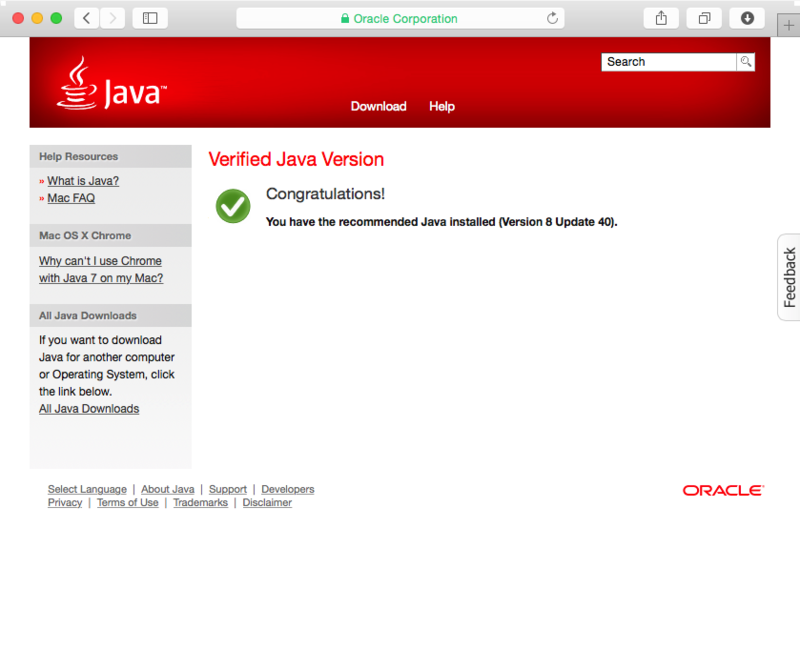 To make things even more confusing, Oracle is providing a different installer for its update feed than it’s providing at the Java.com download site. 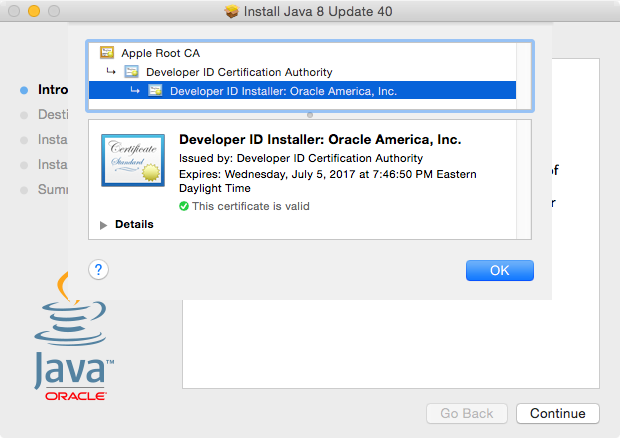 When you update an existing Java installation on OS X via Oracle’s Java update mechanism, you will receive Oracle’s install application for Java along with the selected option to install the Ask.com browser add-ons. 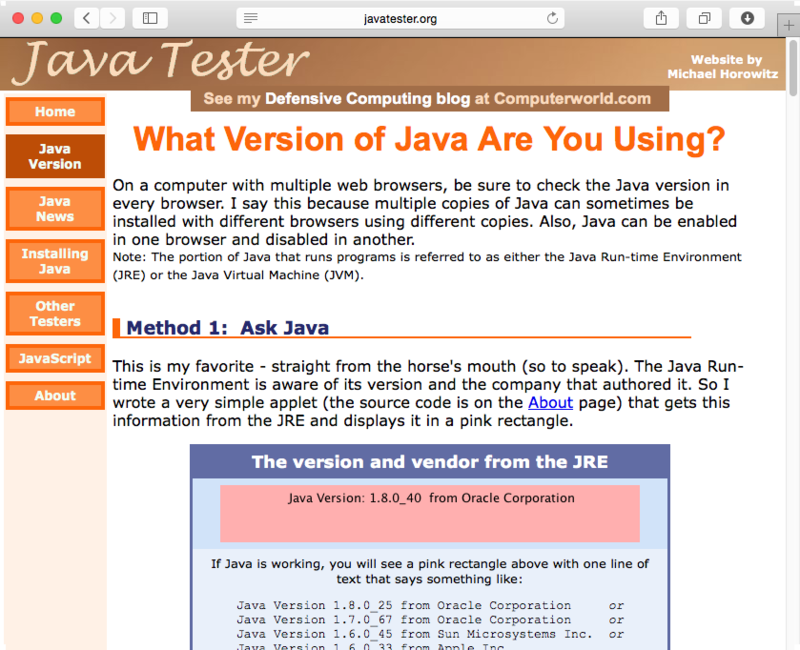 If you download an installer from Java.com, you will receive a standard digitally-signed installer package which does not include the Ask.com browser add-ons. Unfortunately, Oracle has not provided any information about why these differences in installation methods exist. To make sure you’re installing Java 8 Update 40 without the Ask.com browser add-ons, I would currently recommend downloading the installer package available via the Java.com download site. My shop recently made the change from using Juniper Network‘s Network Connect VPN client to using Juniper’s Junos Pulse VPN client. As part of the changeover, I wanted to provide an installer for our folks to use which would install both the Junos Pulse software and the configuration needed to connect to our VPN. Fortunately, Juniper made the process of creating and importing the necessary configuration fairly straightforward. My VPN admin provided me with a copy of the needed .jnprpreconfig config file from our VPN server and I could use Pulse’s jamCommand application to import it. Once I had both the .jnprpreconfig config file and a copy of the Junos Pulse installer, I was able to create an installer using this method that handled both the installation and the automated configuration of the Junos Pulse VPN client. For more details, see below the jump. To help fix this issue, Apple has made a KBase article available showing how to re-hide the /mach_kernel file using the chflags command. As part of a post describing the problem, Tim Sutton has written a script to identify and fix the issue by using the ls command to check for the hidden attribute and then using the chflags command to re-hide the /mach_kernel file as needed. I’ve adapted Tim’s script for use in my own shop to have Casper find and fix this issue. For more details, see below the jump. 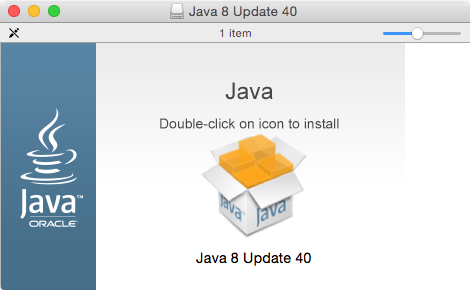 Part of Oracle’s new install application for Java is a binary named MacJREInstaller. This application appears to be what installs Java and governs whether or not the Ask.com toolbar gets deployed. For context, MacJREInstaller appears to be the helper tool referenced when the Java install application prompts for admin privileges. 3. If it determines the Mac in question is in a country where Oracle wants to deploy the Ask.com browser settings and toolbar, a Sponsors.framework.tar file is downloaded to the Mac and uncompressed into /Users/username/Library/Application Support. 4. Determines which web browser is set as the Mac’s default web browser. 5. Displays the choice for whether or not to install the Ask.com browser settings and toolbar. Note: By default, the option to install the Ask.com browser settings and toolbar is selected. The person running the install application must uncheck the appropriate checkbox or checkboxes to opt out. A. The Ask.com browser settings and toolbar for the Mac’s default web browser are installed using a tool called APNSetup, which is included in the downloaded Sponsors.framework. B. 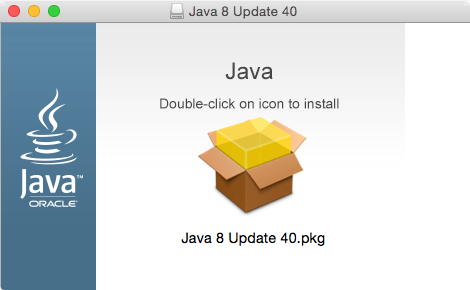 The JavaAppletPlugin installer package stored within the Java install application is installed. C. MacJREInstaller checks back with Oracle again to see what country the Mac in question is in. A. The JavaAppletPlugin installer package stored within the Java install application is installed. B. MacJREInstaller checks back with Oracle again to see what country the Mac in question is in. Note: Even if the installation of the Ask.com browser settings and toolbar is not selected, the Sponsors.framework remains resident on the machine, in /Users/username/Library/Application Support. 7. Once the install process finishes, MacJREInstaller then exits.